This visual indicates where Tailored Intervention Strategies fits in the Transition from Jail to Community model. Welcome to Targeted Transition Interventions. This module concentrates on the development and implementation of appropriate jail transitional strategies and follow-up services in the community. 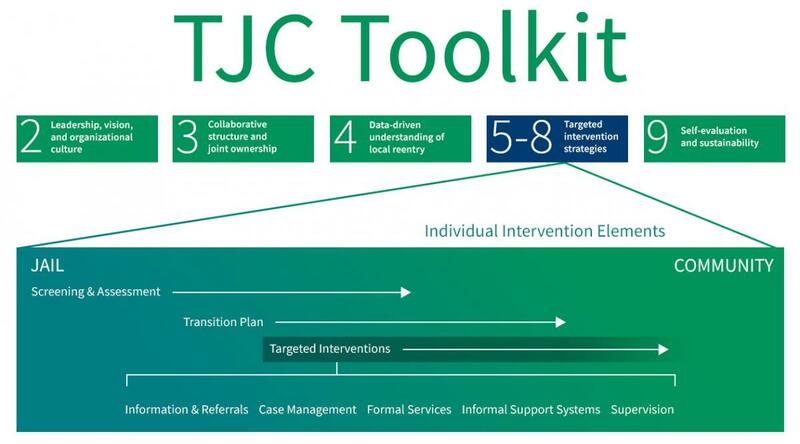 Your jurisdiction's targeted interventions may range from comprehensive programs that transition the individual from the jail to the community, to resource packets and referrals to community-based providers. Some interventions will occur in jail, while others will take place in the community after release. Ideally, many interventions will be available both in and outside the jail facility—beginning in jail and continuing with a community-based provider after the individual's release, facilitating greater continuity of service delivery. "Responding to the reentry needs of incarcerated individuals requires a comprehensive, multi-systems approach that starts at sentencing and continues in the community after release. It's essential to systematically and objectively determine needs that may cause them to reoffend and then directly match clinical and community-based resources to those needs. Courts, probation and parole, correctional facilities, medical and clinical providers and community resources must work together to create a continuum of effective programming behind the wall and in the community to ensure truly corrective services." This module has five sections and will take between 10 and 15 minutes to complete. This module also includes a list of resources to help in the process. In Module 5: Targeted Intervention Strategies, you learned about the 11 tasks outlined in the Targeted Intervention Strategies section of the TJC Implementation Roadmap and the importance of using the risk-need-responsivity model to determine the appropriate strategies to address an individual's criminogenic factors pre- and post-release. The purpose of this module is to identify jail and community intervention strategies based on the risks and needs of the pretrial and sentenced incarcerated population. An intervention can be as simple as providing resource packets before release, or as comprehensive as working with a case manager and community-based providers weeks or months before release and after return to the community. In this module, you will have the opportunity to explore tasks 6 through 11 of the Targeted Intervention Strategies section of the TJC Implementation Roadmap. Task 6. Define scope and content of jail transition interventions currently in place. Task 7. Provide resource packets to all jail inmates upon release. Task 8. Deliver in-jail interventions to selected inmates. Task 9. Deliver community interventions to selected releases. Task 10. Provide case management to selected jail entrants. Task 11. Provide mentors to selected jail entrants. Terms Used in the Field. Define the scope and content of jail transition interventions currently in place. Deliver in-jail and community interventions to targeted populations. Download Module 8 in PDF format.